The train rolled into the station in Moscow at 7:55am. Olga, our long time Moscow city tour guide, met us and we were off on one of her whirlwind and very efficient tours of Moscow. 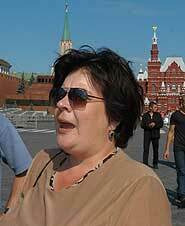 Seeing the Kremlin and Red Square is always a fascinating experience, especially with Olga’s wry and candid commentary. She has been guiding tours in this city since 1979 and noted to us at one point when we were walking around inside the Kremlin that the version of the tour she gives these days are quite different from those she gave over 25 years ago. Olga always does a great job at keeping us on track and on schedule in Moscow and as she promised she delivered us back to our hotel in Moscow at 2pm. We then walked across the street to the Hard Rock Café for lunch. We already feel that we have seen very different parts of Russia and we’ve learned so much and now it’s time to rest up a bit. 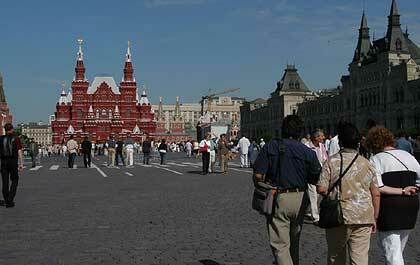 Later perhaps we will walk around and enjoy the summer evening in Moscow. In fact I just saw Wayne and Nikki heading down the street saying they were going to go down towards Red Square to enjoy the evening light. We all will need sleep as tomorrow we are off on a flight to the south into the Caucasus and we will report to you when we get to our lodge down in the Caucasus mountains.